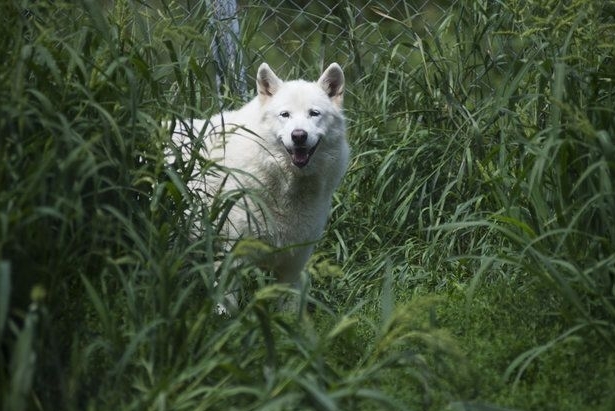 Staff at a Northern Michigan farm are claiming a pure white wolf has been making periodic visits to the area. The Betsie River Centennial Lily Farm, located in the Benzie County village of Thompsonville, posted photos taken on May 23 that appear to capture the rarely-seen canine laying in the grass. The animal has been seen as many as three times, according to a post on the farm's Facebook page. The photos were taken a half-mile from their farm across the Betsie River near the Iron Fish Distillery. The farm has contacted the Department of Natural Resources, who are "very interested," in hearing about future sightings to track its travel territory, according to the post. Calls to the DNR were not immediately returned. "Newest neighbor to our farm. Pictures taken May 23, 2017 show what is believed to be a pure white wolf about 1/2 mile from our farm across the Betsie River near the new Iron Fish Distillery! Has been sighted 3 times we know of including our by our son while on his bike. Michigan DNR very interested and want to know of any additional sightings to determine it's travel territory." The Arctic wolf is relatively unafraid of people, and can be coaxed to approach people in some areas. The Arctic wolf originated on the Canadian Arctic Islands and in north and east Greenland, hence their name. Very little is known about the movement of the Arctic wolves, mainly due to climate. Responses to "Pure white wolf sighting claimed by farm in Northern Michigan"